Sweden's Narnia, a longtime favorite of mine, returns with excellent Course of a Generation, the sixth studio album and first with new singer German Pascual (Mind's Eye, Mendez). While it does represent some of the lyrical themes within (as on the title track), don't be put off by the bleak album cover because the music within is an entertaining blend of melodic metal and hard rock with progressive nuances. Frankly, I think its the best recording Narnia has made to date. Significantly, Narnia captures and propels to new heights what they do best: combining melodic and memorable arrangements, with expansive vocal harmonies, enough metal heaviness, and genuinely catchy hooks. When the Stars Are Falling, Miles Away, the somber Scared and the brilliant Kings Will Come display this genius in abundance. CJ Grimmark deftly doses the arrangements with synths to give even the heaviest number a glimmering quality. German Pascual is a perfect fit for Narnia blending both the power and persuasion a melodic metal singer. Additionally, Narnia expertly presents their Christian faith and philosophy worldview by binding meaningful and provocative lyrics with divinely endowed creative musicianship. This alone is a simple and practical application of the Christian theological principal of the imago dei. In the end, Narnia's Course of a Generation is true delight. Highly recommended. 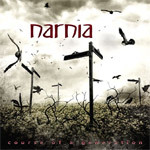 Swedish metal band Narnia is back with Course of a Generation, possibly their best melodic heavy metal album to date.